Do you find it challenging to finish your binding by joining the two ends of the binding strip with a perfect mitred seam? If so, the CutRite Bind Up tool is your answer! It's fast and simple ... with no measuring required. 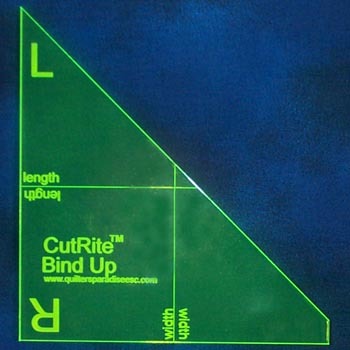 It works on all binding strip widths and its fluroescent green color is easily seen on all fabrics! To learn more about how this tool works, read our simple instructions or click on the button below to watch a short video. "I just had to let you know how great I found the CutRite Bind Up tool - I used it last night and my join was perfect. I have always struggled with this step, so thank you for providing a tool that makes it so easy."